Another of the wonderful home-grown chesses that we love to use in the kitchen is that of Knocklara all the way from Waterford. As far as cheesemakers go we seem to have a superb selection of Irish cheeses at the moment, a skill that’s being honed with great success as a cottage industry. 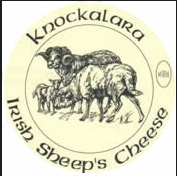 Knocklara farmhouse is an old favourite producing a selection of cheeses of which we use their sheeps cheese. The chief chessemakers Agnes and Wolfgang Schliebitz are very serious about cheese, and have been making their specialty sheeps cheese since 1990, that’s more than 20 years of refinement, and it seriously shows in the finished product. If you are a regular to Kai you will surely have tasted the mouth-watering cheese at some point. 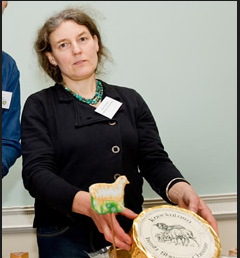 Cheese is handmade at Knocklara using traditional methods and vegetarian rennet. This method increases the health benefits of the cheese, and increases its flavour. The cheese is available to buy at Sheridans if you fancy trying some at home. And if you are feeling adventurous why not try this recipe out with your dinner guests courtesy of Café Paradiso…our favourite veggie restaurant in Cork. Bring a pot of water to a boil. With a sharp knife, score the base of the tomatoes with a cross and drop them into the water for 30 seconds or so. Remove them to a bowl of cold water, then peel off the skins. Deseed the tomatoes and finely dice the flesh. Heat the olive oil in a small pan over medium heat. Add the tomato and garlic, and cook for one minute. Add the orange zest and herbs, and cook for one minute more. Add the passata and 100mls of water or vegetable stock. Simmer for one minute, then remove from the heat and season with salt and pepper. Leave the broth to cool to room temperature. Stir the capers and chives into the cheese. Open the flowers and fill them to about halfway with the mixture. Twist the ends of the flowers to partially close them. Combine the flours and whisk in enough cold sparkling water to get a thin batter. Heat some vegetable oil to approximately 180°c in a deepfryer or pot. Drop the flowers into the batter to lightly coat them, then lower them carefully into the oil, a few at a time. Fry for 3-4 minutes, turning once, until lightly coloured and crisp. Drain on paper.